Barcelona is a diverse city steeped in history; a place where bohemian beachgoers wander between gothic churches and modern tapas bars. Each of Barcelona’s colourful neighbourhoods adds another layer of personality to the city –– but whereabouts should you stay during your visit? Ciutat Vella (the Old City) is usually the main area of interest for those visiting Barcelona. This historic central district boasts many of the city’s biggest attractions, which makes it an unbeatable place to stay in terms of convenience. However, Ciutat Vella itself is divided into several subdistricts, which can make looking for accommodation “in the city centre” a little confusing. One unmistakable landmark within Ciutat Vella is La Rambla, a 1200m long street which runs all the way from Plaça de Catalunya to Port Vell. This former sewage path is today the city’s most infamous tourist trap, with enough kiosks, cafes, hawkers, buskers and bars to make anyone dizzy. Although popular to visit, accommodation on La Rambla is basically limited to a few pricey hotels. However, venturing to either side of the main strip will reveal a complete change of scenery. On the eastern side of La Rambla lies Barri Gòtic (the Gothic Quarter), home to medieval squares, imposing cathedrals, and a 14th-century presidential palace. Despite the appeal of sleeping above its ancient cobblestone streets, the scarcity of accommodation within the Gothic Quarter often makes it better suited to day trips. 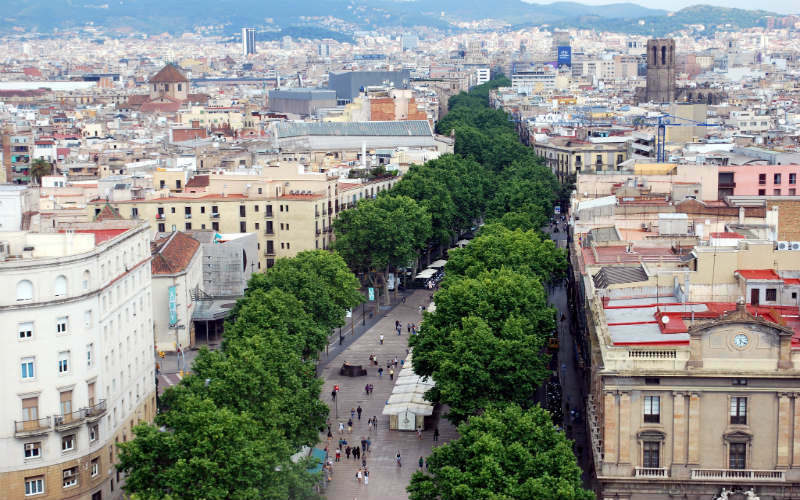 Fortunately, the western side of La Rambla comprises a neighbourhood called El Raval. Although in previous years El Raval was known as a magnet for all things cheap and seedy, today it houses a diverse and artistic community with a number of trendy eateries and attractions found throughout the neighbourhood. With a range of accommodation options available, including bed and breakfasts, hotels, and private apartments, El Raval makes a great base from which you can explore the rest of Ciutat Vella on foot. Meanwhile, the small beachfront district of Barceloneta is filled with charming buildings –– historically the domain of working-class families, fishermen and traders. Nowadays, Barceloneta’s waterfront location and outstanding seafood restaurants make it a popular place to rent an apartment during the balmy Barcelonian summer. Markets, museums, bars, restaurants, churches, clubs and entertainment –– and the list goes on. Stay in Ciutat Vella if… You want to be located in the middle of the action, within walking distance to major attractions, and with easy access to public transport. How to get to Ciutat Vella… As the city centre, nearly all public transport will stop in Ciutat Vella (often by way of its main transport hub, Plaça de Catalunya). La Rambla, Barcelona, Spain. Image Credit: Nikos Roussos. Just behind the Old City is Eixample, a district often referred to as the Modernist Quarter. 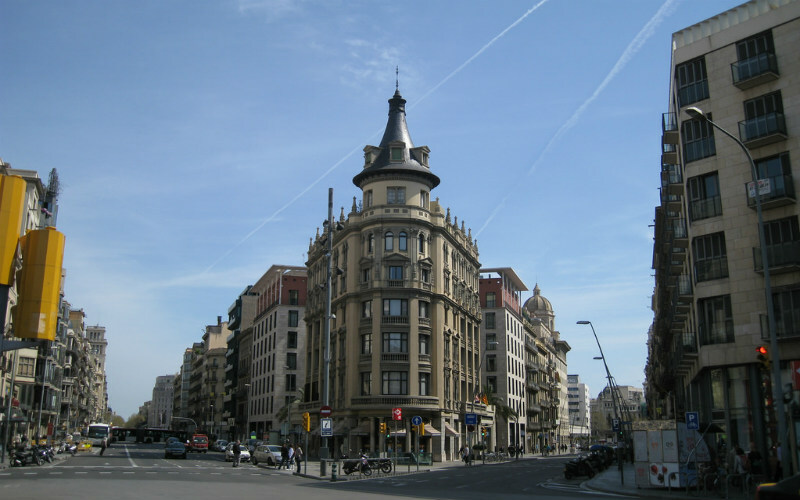 Eixample is divided into halves by the famous shopping strip, Passeig de Gràcia. The right side (Dreta) is mostly residential, while the left side (Esquerra) has more shops, restaurants, bars and cafes; the Passeig itself is an oasis of boutique designer stores and fine dining restaurants. The district is also considered one of the best places to find Modernist buildings in Barcelona. Renowned architect Antoni Gaudí bestowed Eixample with several of his iconic buildings, the most famous of which is the awe-inspiring Sagrada Família. With so many draw cards to its name, it’s no surprise that Eixample is packed with tourist accommodation options, from hotels and apartments to backpacker hostels and cosy bed and breakfasts. What’s in Eixample? Designer label stores, up-market restaurants, and one of the highest concentration of Modernist buildings in the world. Stay in Eixample if… You want to enjoy an incredible shopping scene while surrounded by groundbreaking Catalan architecture. How to get to Eixample: There are lots of public transport options to get into and around Eixample. If you’d prefer to hire your own car, Eixample’s extra wide streets make driving around the neighbourhood a cinch. Eixample, Barcelona, Spain. Image Credit: Cyril Doussin. The district of Gràcia is another step back from the coastline, behind Eixample. This traditional neighbourhood is characterised by its quaint cafes, narrow streets, charming squares and tight-knit community. Today, this picturesque suburb is a favourite haunt among artists and bohemians. Towards the east, the neighbourhood of Sant Marti is a bustling mix of residential and commercial life. 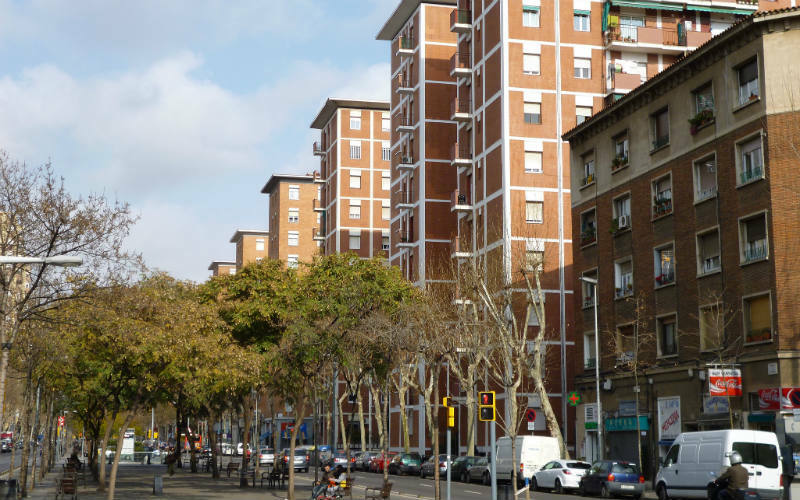 Sant Marti’s apartment blocks offer a typical representation of life in Barcelona, while its enormous shopping malls (Les Glòries and Diagonal Mar) appeal to locals and tourists alike. Sants-Montjuïc is a sprawling district found just south of Ciutat Vella. Barcelona’s largest district, Sants-Montjuïc spans over 2,000 hectares and contains, among other things, a national palace, a castle, and an Olympic stadium. Easily accessible by metro, this district is well worth exploring. While each of these neighbourhoods has its own character and appeal, they are all largely populated by locals. This makes them great places to stay if you’re looking for an authentic Barcelonian experience among families, students, and longtime residents. What’s more, the lack of tourist demand means that rental rates in these suburbs are usually much cheaper than in areas like Ciutat Vella. What’s in the outer suburbs? Beautiful parks and gardens, shopping malls, houses and apartment blocks, art galleries, restaurants, cafes, and some surprisingly good bars. Stay in the outer suburbs if… You want to live like a local and get a true feel of Barcelona. How to get to the outer suburbs: Close to the city centre but far from its crowds, the outer suburbs can all be reached by train, bus, tram, or metro. Sant Marti, Barcelona, Spain. Image Credit: Oh-Barcelona.com. Don’t let us have the final say –– grab a seat on one of our cheap flights to Barcelona and explore this incredible city for yourself.